Fantasy Football N' Stuff: Jay Cutler to Start for Denver! 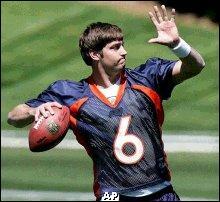 That's right, it was announced today that Jay Cutler will replace Jake Plummer as Denver's starting quarterback. This is not gossip either! It came straight from the mouth of Denver head coach Mike Shanahan. Cutler is often compared to Brett Favre. That could be a good thing and a bad thing. He makes risky throws and tries to force the pass, but Shanahan might make him just manage the game for now. He certainly has the talent around him to be a strong quarterback in this league. Spend a roster spot on Cutler, and look to see if he can establish a good relationship with Javon Walker and Rod Smith. I think the Denver running game will get back on track soon, as they are really being pressured by Kansas City and San Diego to get their act together.